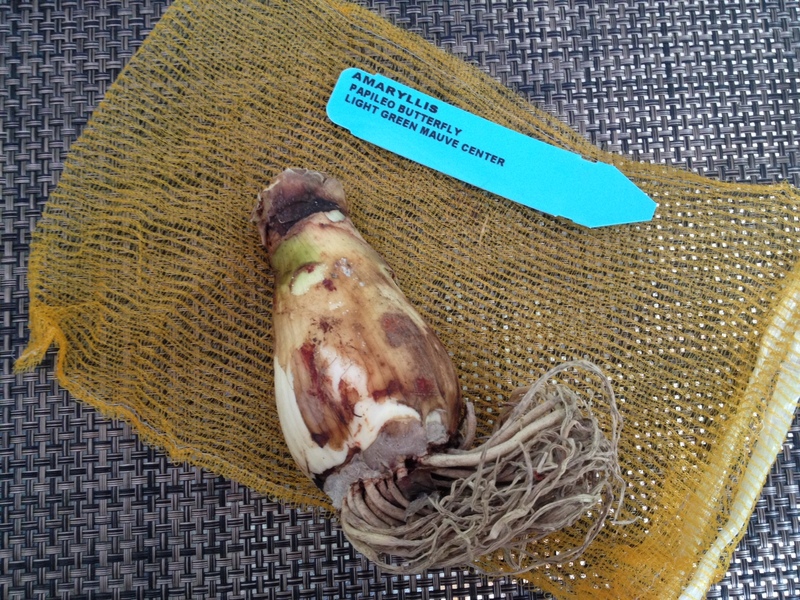 A papileo amaryllis bulb-- commonly called the butterfly amaryllis. I’d almost forgotten my order, placed weeks ago, for a single amaryllis bulb. I limited myself to only one, because the variety I wanted was pretty pricey–$18, plus shipping costs. But I came home yesterday and found the cardboard box holding my new treasure sitting on my doorstep. That’s the bulb, pictured above. Doesn’t look like much, does it? Even to me, it hardly seems worth the same amount of money that would buy a nice dinner at a local restaurant. Oooo….aaahh…are you taken by its beauty, too? You can buy amaryllis pre-potted, from nurseries and all sorts of garden centers, but the variety I’m growing is a rare type called Papileo, and it’s commonly known as the butterfly amaryllis. Its nickname comes from the way the flowers open, much like the wings of a butterfly in flight. I’ll post more pictures when it blooms, so you can see the details. For now, I’m tucking my bulb into the soil and coaxing it back to life with sunshine and a warm spot in the room, and a big drink of fresh water. I can’t wait to watch it grow. Gardening really is all about faith, isn’t it? You commit something you value to the ground–or God, if you’re a person of faith–and do your best. But your biggest task is to simply stand back and wait, and let something bigger than you do its good work (mother nature, in this case). I’m so eager to see it develop, just as I’m eager to develop my writing career and my blog. Please visit me again, and we’ll see what we can grow together.